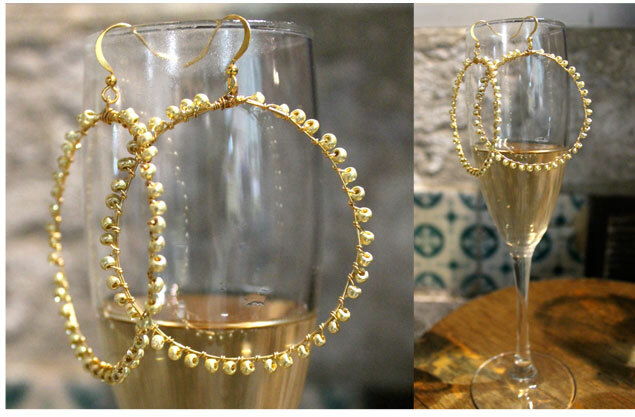 Right before I went to Lisbon I decided that I needed some gold hoops as part of my holiday get-up. In the spirit of not spending money I made my own using materials I already had. I have to say I am really pleased with how these turned out; the tiny seed beads and mix of golds stop them from looking too trashy, the size of the hoops keeps them fun and best of all they are really light to wear so you avoid dreaded lobe ache. These seem a little fiddly but I promise they are really easy to make once you get going and don't take more than 30 minutes to put together. All steps are below. Step 1) Take a length of wire, you will find your wire comes off its roll in natural hoops, use about three of these as a guide. Wrapping the wire around itself twice make a circle shape, mine was about 7cm in diameter, bring your ends to the top of the hoop and twist over on each other. At this stage you might want to adjust you hoop size. Step 2) Once you are happy with your hoop size, take one of the lengths of wire (I used the one on my left) and tightly wind round the top of the hoop three times, snip off the remaining wire. Leave one length remaining. Take a second length of wire (approx. 40cm) and wrap tightly at top of the hoop, you are now ready to start beading. 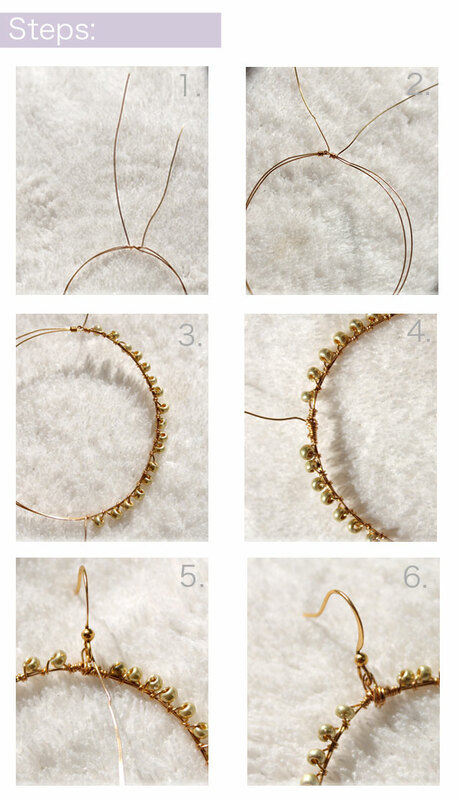 Step 3) Thread a seed bead onto the wire and wrap tightly in a clockwise direction onto your hoop, do another wrap without a bead, repeat all the way around your hoop. I used my fingers rather than pliers as it is softer on the wire and stops it breaking. Step 4) To finish tightly wrap the remaining wire around the top of the hoop and snip off any remaining wire. Step 5) Taking your remaining length of wire fix your earring hook onto the hoop, wrap a few times so it is really secure. Snip off any remaining wire, and you are done. Voila! I have been wearing mine loads since I have been back, it goes to show gold hoops are for life not just for holidays - happy making! Lovely! 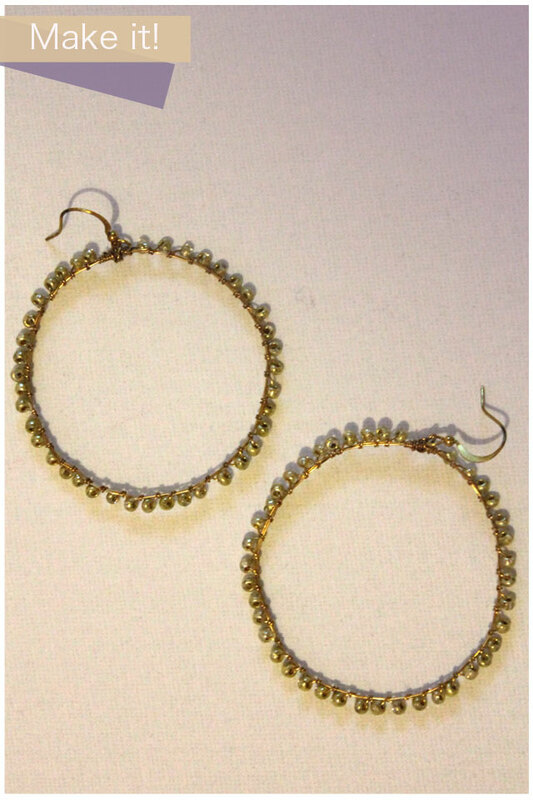 I especially like that you made the hoops yourself-- more resourceful than going out and buying a new pair of plain hoops!